On Tuesday, September 4 we moved from Portland, Oregon to the ranch. My sweet husband, Logan, grew up on a cattle ranch in northern California, about twelve miles east of Yreka. The ranch is nestled in a small valley called Little Shasta and it’s one of my favorite places on the planet because it’s so beautiful. Originally, we had planned on moving to Chico in a few months. However, we’ve always wanted to live in a rural area and this is the perfect time to give it a try. We’re trying to be open to where life takes us and if we like living on the ranch we’ll stay. For now, we’re going to enjoy the ranch and time with family. Rural living is going to be a really fun adventure! Throughout the first part of the year, I was traveling between Portland and Red Bluff because my dad was really ill. We had been thinking of moving back home for the past year and my dad’s illness made us rethink how and where we lived. Then in May, Logan found out that his job was being moved to Boston. He was offered a position at the new lab, but he turned it down because we couldn’t imagine living so far away from family. Then on June 10th my dad passed away and that cemented our decision to move back to California. It became clear that our family needed us as much as we needed them. Now that you know a little bit about why we moved, I’ll tell you about moving day. On Tuesday morning, we woke up at 4:45 a.m and our plan was to hit the road, with the tiny house in tow, by 6 a.m. However, we were delayed. My mom backed up her truck to hitch it to the tiny house and then turned it off. But when she tried to start the truck again, it made a horrid clicking noise. We all suspected that the battery was dead. Thanks to a prompt response from AAA my mom’s Ford F350 received two new batteries and we left Portland at 9 a.m, right after the morning rush hour. I’m thankful that the battery died in Portland. It wouldn’t have been fun to be stuck on the side of the road with the tiny house or at a rest area waiting for AAA to arrive. Overall, the move itself went really smoothly. Logan drove the whole way and my mom and the cats kept him company. Dee and I followed Logan and my mom down the road, just to make sure there were no problems. Dee’s car was also helpful when Logan had to merge into a new lane. We ran interference and flanked traffic for Logan. It took about nine hours to travel from Portland to the ranch. We stopped a lot to check on the house and to take breaks from driving. Today, I need to clean the windows because there are so many finger prints and a few face prints from folks looking into the house. 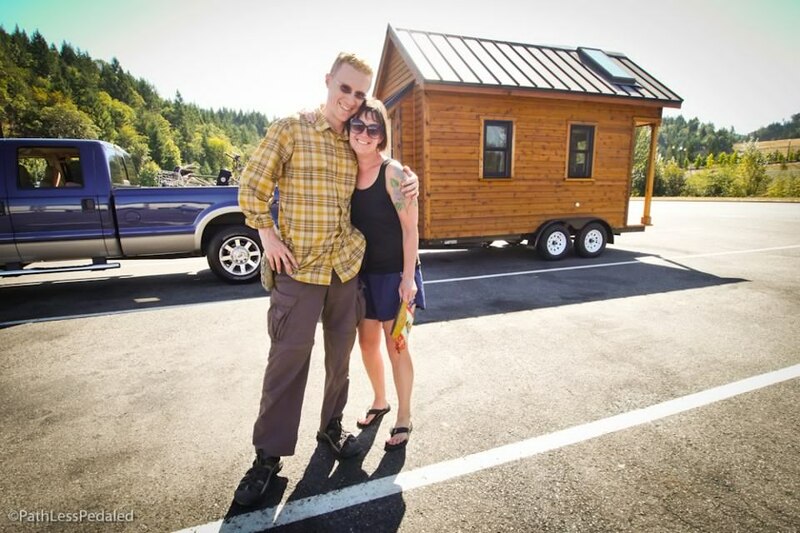 At every rest area, people were incredibly curious about the tiny house and peeked in the windows. I chatted with truckers, older folks with RVs, and a few people who were traveling to Ashland. Also, I told my mom that she should be my PR person. She was telling everyone about my new book and handing out my cards too. Serendipitously, we ran into our friends Russ and Laura on the road as well. They were headed down to Ashland to do some work. Russ got some fun photos of the little house rolling down the highway. Check out their facebook fan page to see the photos. I’m thankful that we have a house on wheels. However, moving the house wasn’t as simple or stress free as everyone predicted. I didn’t have to pack too many of our belongings in the house. However, it took a few hours to get the house out of the side yard, in Portland, and settled into the driveway. Then there was all the outside stuff — like the compost barrels, bulk food, bikes, paver stones, and other odds and ends — that had to be loaded into the house and the back of the truck. Plus, watching my house zip down the highway made me anxious. I’m incredibly grateful that we made it safely to the ranch with no problems. So far unpacking has been easy and we are settling into our new space nicely. And the cats are doing great. They are currently sitting on the front porch basking in them morning sun and exploring the big yard. They aren’t sure of what to think of the cows and horses just yet. Finally, this post wouldn’t be complete without photos. Below you’ll find our move in pictures. I hope you enjoy the shots! If you have any questions, feel free to leave a comment. Sep 3 What’s in your bag? Sep 1 On the Road Again . . .